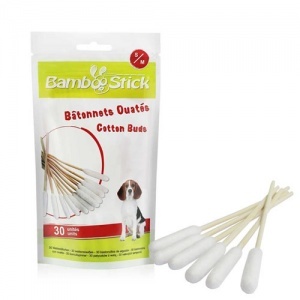 BambooStick dog ear cleaners are king size cotton buds specially designed for effective dog ear cleaning and ear care. BambooStick have a unique design. The cotton head allows for quick, optimum cleaning of the dog’s ear canal without any chance of damage to the eardrum. They are 12 times more absorbent than a standard cotton bud and the soft cotton is designed to protect the delicate pinna and vertical canal. 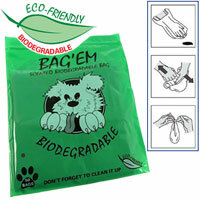 Standard human cotton buds are not suitable for cleaning dog ears and might be harmful if used. Unlike standard cotton swabs, BambooStick takes into account the distinctive features of the dog's ear, allowing you to clean the ears without any danger of touching the ear drum. Thanks to the size of the cotton head it is quite impossible to pass the ear canal turn and to touch its deep stretch. The smoothness and softness of the cotton head protects the skin and the mucosa of the ear canal. 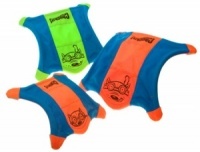 Thanks to its unique shape, the cotton head surface area is maximised and allows for quick and complete dog ear cleaning. The stick is easy to handle, it has an appropriate stiffness and most of all it does not become slippery when the ear is cleaned with an oily liquid. 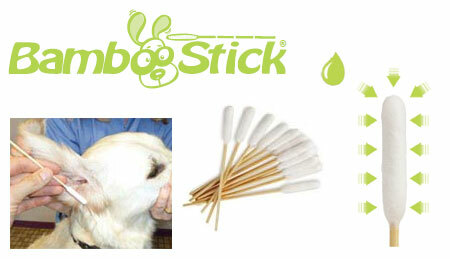 The BambooStick is an ear cleaning implement for dogs, used and recommended by numerous vets. 1. Hold (or better still, have a helper hold) your dog’s head. 2. Pour a dog ear cleaning liquid (a few millilitres) into the auditory canal. 3. Massage the base of the auditory canal for about a minute. You should hear the sound of the liquid in the canal. 4. Tilt your dog's head to let out any excess solution or let them shake their head. 5. Use the Bamboostick dog ear cleaner to absorb the residual liquid, and remove the dirt and secretions stuck to the auricle and the entrance to the auditory canal. BambooStick is designed, tested and approved by veterinarians. 100% biodegradable. 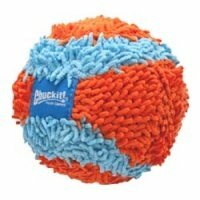 The head is 100% medical grade cotton wool. The stick is 100% bamboo, a renewable resource. Each stick is a single use product. 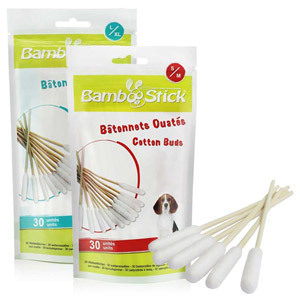 The head of the cotton buds are the same shape and size but for small dogs (size Small / Medium) the sticks of the cotton buds are slightly shorter in length. A great way to clean my dogs ears. Very successful. These are exactly the same as my Vet supplied at a fraction of the price. Perfect for keeping my Cockapoos ears free of dirt and infection. 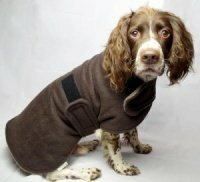 We have two dogs with ears that need attention so these are just perfect to help with a sometimes unpleasant task (outer ear only) Importantly they do not leave any cotton residue on in the ear. I bought these at the same time I bought the cleaning solution, they are easy to use, and I felt more confident that I would not damage the internal ear, I will only use these on my dogs ears from now on! I took the dog to the vet with sore ears. On examination he said that they had just waxed up and periodic cleaning would alliviate this. He suggested cotton buds (large) with a long stick so that cleaning could be effective. I tried the internet and found D for Dog and these bamboo ear cleaners. They worked really well and I have told all my friends where to buy them. I have a happy dog now thanks to your product. Since my dog has got older he has suffered with waxy ears. I previously used cotton pads and cotton buds to clean in between the groves in his ears. I tried these bamboo ear cleaners and the results were great, it only took a fraction of the time it used to with the cotton pads and buds. 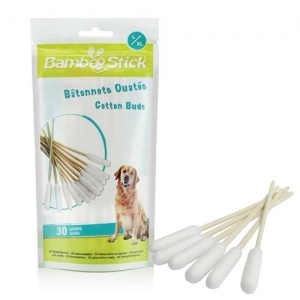 The bamboo sticks are strong, which means they dont bend like the normal cotton buds and the actual cotton on top of them is attached well so there is virtually no chance of it coming off in the dogs ear. The fact that the cotton tip is so big means it covers a greater area of the ear, picking up more wax. This means less time cleaning them, which means minimal discomfort and annoyance for the dog, making it an overall more pleasant experience for us both! I would recommend them and for 50 sticks in a packet, it is great value!